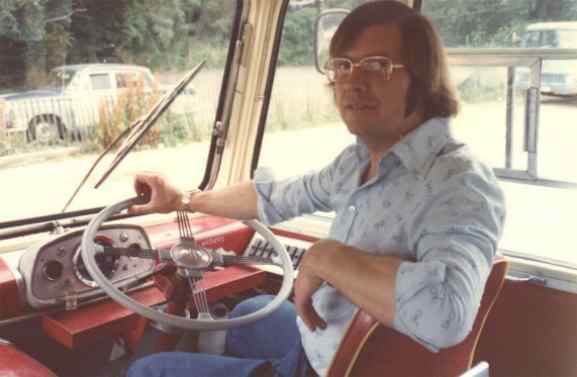 It's a hot summer Saturday in August 1977 and I have agreed to help out my friend John Walker, proprietor of Stanbridge Motor Services, by driving the Wimborne service for the day. Arrive at Stanbridge depot yard at 8.45 with a cheery hello to the regular driver Geoff who is off on a private hire job with students to Bath and Longleat - it will make a pleasant change from the bus route for him! Maroon single deck Thames VFN549 is the regular performer, and the bus is washed, fuelled and waiting for me (one of the perks enjoyed by part-time drivers). She starts first time. Leave her ticking over for the engine to warm up for a minute or two whilst I collect the ticket rack and cash bag. Set the blind to Wimborne and leave the yard at 9 o'clock, carefully easing out of the depot entrance whilst watching out for fast moving traffic from either direction. Unhelpfully the road bends away to left and right severely restricting the line of sight - and whilst VFN is a trusty steed she is a bit long in the tooth and lacking in rapid acceleration. ....... I was a lot younger then! A mile northwards up the B3078 and turn left at High Lea Cross, then onto the bridge over the River Allen towards Witchampton - with a sign threatening transportation to Australia for life if anybody is caught damaging the bridge. Five minutes further and we are at our starting point by the old bakery in Manswood. A hundred yards down the gravel lane to our left is the cottage where Ernie Toomer lived - it was Ernie who started this off as a motor bus route back in the 1920s. No passengers waiting here so prompt at 9.15 we set off for the first journey of the day into Wimborne. Turn right at Manswood Cross Roads and waiting at the shelter are our first three passengers. More cheery `good mornings' as we drop down the slope to the school and pick up three more travellers. Two more as we climb eastwards and then left into the double-run to serve Moor Crichel, catching glimpses to our right of Crichel House, home of the Martin family, set in the grounds of Crichel Park with its big fresh water lake. Reverse VFN carefully into the timber yard entrance, taking care to avoid the waiting passengers congregating there. Now we are a dozen and everybody seems to know everybody else. We retrace our steps for half a mile and turn left at White Farm, noting on the wall the huge virginia creeper which will turn a wonderful red as autumn approaches. Dropping down Lawrence Lane we wave to Mr Biles outside his garage and workshop, then we turn right and pull up at the bus shelter that serves Newtown. Five people wait here, and they have walked up from the cottages by the mill where the paper for our bank notes was made until recently. Pleasant waterside meadows to our left as we come into Witchampton. None of the villages we have come through so far has a pub, and nor indeed has Witchampton - but it has a shop and a post office and a licenced club. 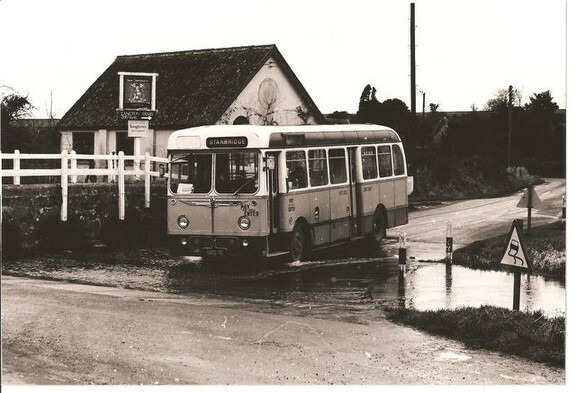 A dozen people old and young spill out into the road beside the wooden bus shelter and clamber aboard. Handbrake on, switch off and pick up the ticket rack - brightly coloured Bell Punch tickets but no Bell Punch ! Now we have to go round and collect the fares from those on board. It only takes a few minutes and as nearly everybody is either a regular or a local, most have the exact money ready for me. Swiftly back in the driving seat and off round the s-bend by the church and the manor house and two more people are waiting for us at the lower end of the village. This is a good load, over thirty people, it must be the warm sunny day that has brought people out to ride into town. Over the River Allen again and two more people picked up at High Lea, then a right turn and join the B-road south towards Wimborne. We slow as we come round the bend by the depot yard at Stanbridge and a young mum and her two offspring (and pushchair) are waiting. That makes a tally of 35 excluding the baby, but we find just one more regular client at Clapgate before arriving in Wimborne. We stop first by Cowdreys bakery, hmmm, the smell of the bread is really mouthwatering. A dozen people leave us but the rest stay on board as we twist round narrow East Borough and pop out into Wimborne Square where we drop off all the other passengers, with those who joined us most recently paying their fares as they get off. It's 9.50 by the clock on the Kings Head and we're bang on time, so those going on to Poole or Bournemouth have made their connections easily. Round the block to the car and coach park to park up and then we have an hour to ourselves, perhaps a bun from Cowdreys or a stroll round Woolworths to chat to one or two of the Saturday girls when the supervisor isn't looking. It's also pleasant just to stroll around in the sun as Wimborne is an old fashioned market town with a Minster Church dating back to Norman times, and the people still have time to stop and pass the time of day with you. The hour soon passes, and collecting VFN549 we come round the block again, mingling with the holiday traffic on the busy A31 for half a mile - the by-pass has yet to be built. We wait by the Midland Bank in The Square, sharing the stop with Wilts & Dorset buses. At 11 o'clock we start the first outward journey of the day, taking back some of those whom we bought in a while ago. We have sixteen or seventeen on board including one or two townsfolk going out to the villages to visit friends or relations. 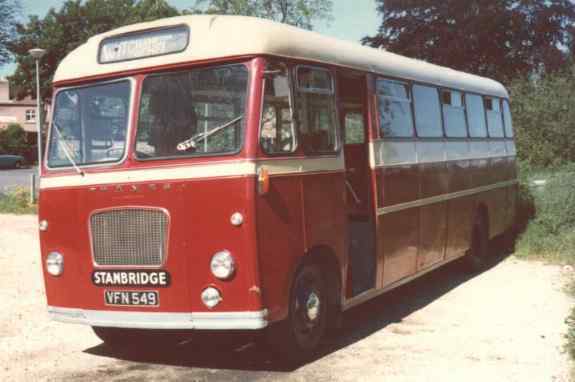 Timekeeping is easy on a Saturday as we do not have the diversion to Hinton Martell and back to contend with - a 1971 addition to the original Stanbridge route when Hants & Dorset withdrew their service to the village. We drop people off in twos and threes and by 11.35 we are back at Manswood again. We reverse and immediately set off for Wimborne, all the layover time being at the town end of the route. It's pleasant driving round the lanes on a summers day, and we meet little traffic going the other way. Occasionally a tractor or a farm vehicle, but courtesy and good humour prevail, and we always find a spot to pass each other by. Not so many people picked up on this run into town, just one or two here and there and maybe a dozen in total at most. We retrace our steps and as we pass the depot at Stanbridge, John Walker the proprietor appears for a lift into town for bread and milk from the shops. Back in Wimborne at 12 o'clock and this time in the cafe for a cup of tea and a chat with John, discussing the ups and downs of the bus and coach business. Back on the stop in The Square in time for the 1.00 departure with destination blind correctly showing Witchampton and Crichel. Another fifteen or so people, no make that sixteen, here's a young lady running across the road frantically waving at us. Drop John off at Stanbridge and then out through the villages, and a longer journey this time as we go past Manswood and still a mile and a bit further down the hill to Long Crichel, which is only served on Tuesdays and Saturdays. A tight reverse into a narrow farm track opposite Higher Farm and then pick up the postmistress and her husband outside the post office ready for the trip into Wimborne. 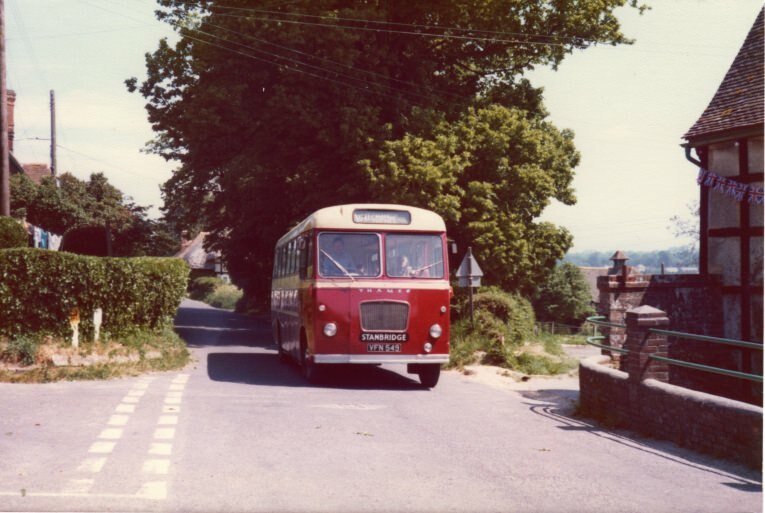 As a classic example of true country bus scheduling we were not due in Long Crichel until 1.35 by the timetable yet we are also the 1.20 departure - but it's not a problem, that's just the way things have been done all these years. Two and a half more passengers at the cross roads (but is she a half fare - she says she is under fourteen but in her glad rags and make-up she could easily be sixteen or seventeen!). A few more at Manswood and three or four more at Moor Crichel, half a dozen at Witchampton and an easy run back into town, although we end up three or four minutes later than the scheduled 2.05 arrival in The Square. Now it's our lunchtime and two hours to kill, so we run back empty to Stanbridge yard and tuck into the last of the sandwiches we have brought with us. Brian is back from an airport transfer to Heathrow and Rob comes in to get his coach ready for an evening private hire. So there is plenty of drivers gossip and catching up and teasing and repartee and the retelling of some well known tall tales of those modern knights of the road, the PSV drivers. I tell them about my morning trip on the Thursdays only Blandford route ten days previously. You can't really say no to intending passengers on a once a week market bus and I just didn't notice the policeman standing in the shop doorway who counted the 70 passengers who got off my 42-seater bus that morning. Then one of the regulars from Tarrant Monkton, who hadn't travelled in with me that day, came along and interceded with the policeman and then gave me his fare. "You don't have to pay Mr Green, you weren't on the bus! ", but he replied "it's worth the fare just to keep this bus running, son, I got a lift in earlier as I had a doctor's appointment". It's a route with good caring passengers and it's a scenic route too, this run to Blandford, you go through the watersplash across the River Tarrant, and in the winter there can be a couple of feet of water there - not a good place to stall the engine but great for photographs of a bus with a bow wave. It's also a complicated and somewhat circuitous route to explain to a new driver because for the first few miles of the run every time you see a signpost pointing towards Blandford you turn the other way. All too soon it is time to run back empty into Wimborne and wait on the stop for the last trip out at 4.20. There used to be a later one back at 8.30 but that was dropped a few years ago, and before that there was one at 10.20 as well, but television put paid to the evening trade just as much in the country as in the town. So with about twenty people on board we pull out of Wimborne and drive back to Witchampton, Manswood and Long Crichel. It's still sunny and there is a contented buzz of gossip around the bus as purchases are compared and opinions exchanged. Back down the hill to Long Crichel and drop off the postmistress and his wife - wonder what happened to the maybe fourteen year old young lady, she didn't come back with us. I expect she's gone off to the bright lights of Bournemouth and will get a lift back later. Reverse in the farm track again, once more ignore the illogicality of the timetable (5.05 arrival for 4.50 departure) and turn towards Wimborne one last time. This trip will be very quiet, some weeks there are no passengers at all and we can sneak into the depot at Stanbridge and not bother going all the way into town. But this Saturday there are two or three to take back who we brought out earlier. One of them from Manswood is slightly the worse for wear, one too many glasses of sherry perhaps, but he is no trouble and nods off on the back seat for a while. Twenty five to six and the last person is dropped off in town and ten minutes later we are backing into the depot yard, we stop by the fuel pump and John comes out to fill her up. I give him the tickets and cash and bid him goodnight, leap into my car and drive off home for dinner. An interesting day for the country bus driver - particularly one of the occasional variety like me. Although not much of an operation in big bus company terms, we have performed a useful social service all day and the villages would be the poorer without us. VFN549 is parked up and can now slumber peacefully in the yard until Monday morning. If anyone has a picture of VFN549 going through the watersplash at Tarrant Monkton I would be very pleased to have a copy!